Hi everyone, I’m Ha and this is my first blog post. Thanks for joining me! The very last week of all these final exams and assignments has past and now it’s time for a break, a refreshment and a run-away plan to a beautiful place where we can enjoy ourselves, see spectacular scenery and finally find our inner peace. So, I am excited to share my experience travelling there with you today, especially for those who don’t have a car and has a limited budget like me. Anyone who has been to this island must know the feeling of a cozy homeplace with a relaxed village atmosphere. The charming atmosphere is definitely made by the delightful bungalows and houses, which provides visitors with a wide range of choices for accommodations. I found a small bungalow on Point Lookout through Airbnb for me and my friend (it’s a house for 3 people), which cost around $150 in total for 2-3 people per night. Travelling to North Straddie is an interesting experience for me as I went there by three different means of transport (walking not included). First, we went from Central Station to Cleveland station by train. Then, we took a bus from Cleveland station to the port nearby and got to the island by water taxi (if you want to drive there, there will ferries available to take you with your car but you should book online to save the spot). There are three little townships (Dunwich, Amity Point and Point Lookout) scattered over the island so you can travel among them by bus or car (if you have one). Most of the locations on the island can be accessed by bus or on foot. If you are going to Blue Lake and Brown Lake I suggest going there by car due to the long distance (it is approximately from 7km to 20km depending on the township you stay). One of the things I’m so into about this island was the food. The seafood here was fresh and wide variety of choices. When me and my friend arrived there, we were so hungry so we decided to try the fish and chips at Fins N Fries for lunch. The servings were pretty big that we both felt very full after that. You should also visit Mal Starkey’s Seafood House for some fresh local seafood, very reasonable prices and highly recommended! Lastly, the amazing views were definitely my favourite thing about North Straddie Island. After lunch, we went to Cylinder beach and enjoyed a spectacular sunset there. The next morning, we woke up early at 5pm and walked to the North Gorge Walk to see the sunrise on the sea. We were struggling to wake up that early, but it was totally worth it. I strongly recommend watching the sunrise there since it was definitely the most beautiful scene I have ever seen. Another amazing thing about this island is that you can see adorable kangaroos at a close distance. It was my first time seeing a kangaroo in real life. That was such an unforgettable moment! It is so great sharing this fantastic experience with you all. 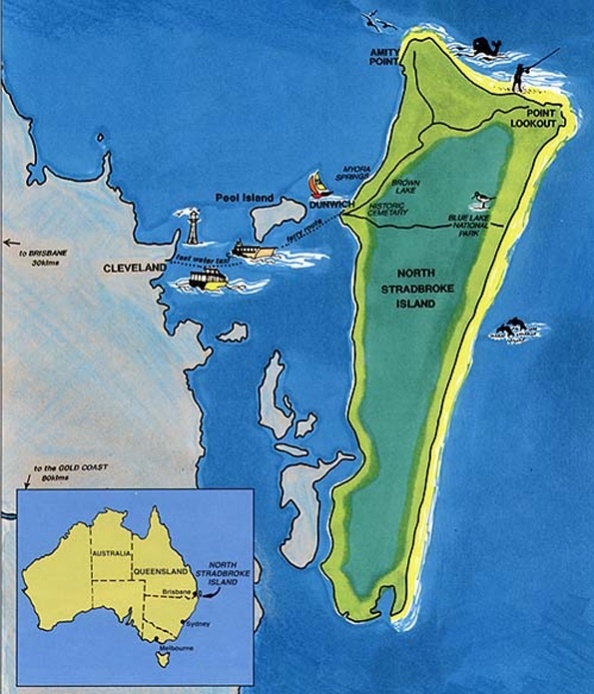 I hope this would be helpful if you are considering North Straddie as your next destination or just want to find a place to explore. We only have a few weeks left before next semester starts. So, why not pack your bag and begin your journey now? And, don’t forget to bring your best friend along! A goal-oriented marketing student from Vietnam who is dedicated to pursuing a career in Marketing and Event Management, and aims to empower international students to raise their own voices through her stories. A storyteller who is passionate about human connections and cultural diversity, thus always busy participating in various social activities. A nature lover whose favourite thing is to walk along the Brisbane river and enjoy the chilling breezes on a sunny day. Through this channel, Ha looks forward to seeing what else is in store and is excited to share her journey studying here in the beautiful sunshine state with students around the world.